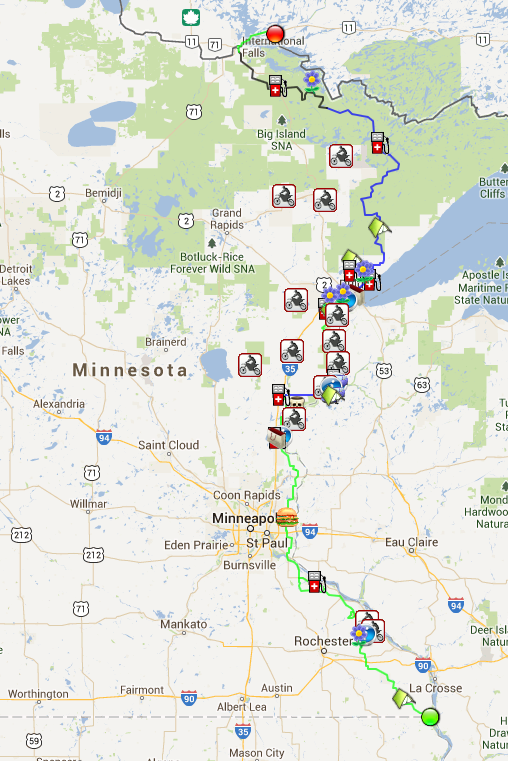 What is the Trans-Minnesota Adventure Trail (TMAT)? The Trans-Minnesota Adventure Trail has been in existence for a few years now, but I still get questions about what it is and how to get more info. In fact, many of the riders becoming members of www.MinneADV.org say they don’t know what the TMAT is. So I thought an updated blog post might be in order. A few years ago I became a bit frustrated that there wasn’t one place a new dual-sport or adventure motorcyclist in Minnesota could go to find trails to ride. 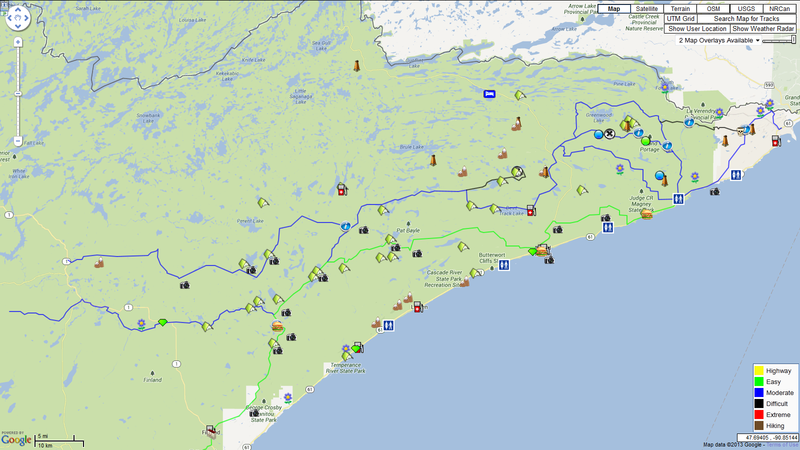 The DNR does a good job with its website and paper maps, but the OHM (off highway motorcycle) areas they support are targeted at the dirt bike crowd. Other riders I spoke to had the same frustration. After spending a day riding the Trans-Wisconsin Adventure Trail, I thought, “Gee, why doesn’t Minnesota have one of these?”. The Wisconsin trail had a website for more info, GPS tracks, and a following of riders that contributed to curating the route. So with that, the idea for the TMAT was born. I started gathering DNR maps, county maps, national forest maps, satellite imagery, etc. I also started soliciting rider help on ADVrider.com and from people I met at rider gatherings. Finally, I just got out and started riding the routes. What I found was that there were many good off-pavement riding areas in Minnesota, and those areas connected together quite nicely with scenic pavement routes. The master route spanned across the entire state from south-eastern MN to International Falls. It went through popular areas like the Zumbro bottoms, Nemadji state forest, and Superior National forest. Many many thanks go out to all the riders who contributed to this and helped prove out the routes. Within a year the eastern route was complete. MinneADV.info was started to blog about the process, and host the GPS files. Later we moved the files to DualSportMaps.com since their site and tooling is really the best on the web for this sort of thing. We now also have MinneADV.org as a place for riders to post group rides and events, and meet other Minnesota riders. We now have hundreds of followers of the blog and over 80 riders on the meetup site. The TMAT is also consistently one of the most popular maps on DualSportMaps.com. The trail has also been extended to include a TMAT Central route so that riders from the western parts of the state can hop on and connect to other trails. The best trails on the TMAT are not found along the main Central and Eastern routes however. The TMAT has expanded to include “loops”. The loops target prime areas of the state where the best trails are. They are meant for someone who doesn’t want to travel across the state, but rather wants to loop through an area for a day or weekend and come back home. For example, the Gunflint loop branches off from the TMAT East and has some of the most scenic views in the state. If you want more info on the TMAT and all the related loops, including the GPS files, you can find it here. Keep checking back. The trail is always maturing and growing. If you’d like to see photos and videos of the trail you can find that here as well. Use the Contact Us link if you want to send in your own photos or video. They are always welcome! Use the link to send ideas for new route modifications too. Minnesota is a beautiful and rugged state, perfect for Adventure riding. If you haven’t ridden the TMAT yet, there is no excuse. There are over a thousand miles of trail. A section of it is likely just short ride from your front door. Get out and enjoy it. You are currently browsing the Minnesota Adventure Riders blog archives for September, 2013.